Simplify Your Life With Visual ControlsEliminate The Muda! Isn’t amazing how you can go through life and not notice the obvious? Humans tend to become de-synthezised to the common. We often neglect the routine and miss the opportunity to capitalize on easy tools and techniques that can make our life better. Take a look at the picture for a moment, nearly half the population knows instantly what it is. The other half (sorry ladies) are trying to ignore the elephant in the room. Take a good look at this urinal. Do you notice anything odd about it? Yes, there appears to be a fly sitting not far from the drain. I say appears because, it is a picture of a fly that is painted there. This urinal is located in Munich Airport. 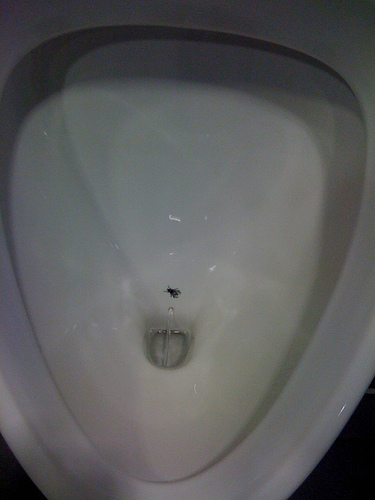 According to studies the simple application of this urinal art irresistibly draws boy’s (that’s what we all are at heart) to aim at the fly. As a result the “misses” are reduced by nearly 80%. It’s a visual control, and it reduces the amount of work the janitors need to do as a result. We use and follow visual controls every day. Think about how common they are. Imagine driving to work with thousands of your neighbors but without the benefit of lines painted on any roads, directional arrows, stop signs or signals. Life would be a little chaotic! Think about how difficult and time consuming it would be if ball fields, schools and restaurants didn’t provide directional signs for the restroom. Consider the challenge of navigating an airport that had no gate numbers or status boards. For society to manage efficiently we need visual controls. It helps people move and communicate efficiently. It reduces the burden on employee’s whom won’t have to answer thousands of the same questions every day. These visual controls are kind of like life’s FAQ list. They guide where to go and what to do, including peeing into the urinal. Visual control is a very important part of the philosophy of managing your life in a lean way. Establishing visual controls for yourself and your family can and will help you live more efficiently and potentially more profitably. Anytime you can be more efficient, think more money. You will waste less resources being more efficient. The resources you save can be time, material, energy or even money. How could you apply this concept of visual control to improve your life? Ever fight with your kids about cleaning their room? If you tell the kids that their toys belong in their room, don’t be surprised to find them there, thrown haphazardly around the room. Could it be that your child simply doesn’t know what to expect or where exactly things go? Involve your children in the process; use old shoeboxes or milk crates for toys. Label the outside so there is no room for debate in the future. Use recycled margarine, or cool whip bowls for the marbles, magnets and other small bits they collect. Designate specific drawers with placards or pictures for different types of clothes. Speaking of clothes and closets, what about yours? Are you like most Americans and holding off that job of organization until the spring? Why do we spring clean once a year? Wouldn’t it make much more sense to implement a process that keeps the closet clean and organized all year long? While others are spring cleaning we could be enjoying the spring! It just takes a few visual controls. A great way to start on a project like a closet is to use the 5S’. The 5S’ are a defined method of cleaning and organizing. Once done however, use the concept of visual controls to help maintain the work you have done. Designate one end for clothes that are out of season. For the clothes that are in season, separate them by formal, business and casual. You could even go the extent of organizing them based on what goes well together making it easier to find outfits each morning. You don’t have to buy all new hangers that are color coded; you could just use some labels or masking tape on the edge of the shelf above. Think about those round plastic signs on the racks at the clothes store that show the different sizes. Could you make something similar to segregate your clothing visually? Pick up several colors of tape and put a small piece at the top of each hanger. For shoes, leave them in boxes, take pictures of each pair and attach a picture on the front of the box so you know where every pair is. A company that I worked with once was having difficulties because their office supplies kept running out. They tried instituting a process that required you to fill out an order form when you used the last folder, notebook or pen. It didn’t work. They realized that when people went to the supply closet, they had generally already run out and were getting resupplied while in a hurry. Associates just wouldn’t stop to fill out the form. So then they tried a different technique. Strategically located at the supply closet and several other areas in the office were trays with a label “supply wrappers” and a small picture as a visual reminder . If you grabbed a box of pens, or folders you were asked not to throw the packaging away but to put it in the tray. This “trash” became a signal that supplies were used and needed to be replenished. Visual controls can be used for so much more though. Visual controls are not just for clothes, toys and supplies. You can use visual controls for your finances as well. We all want the visual controls for our safety when driving, why wouldn’t you be open to a visual control for your financial management? When trying to get control of money some personal finance bloggers and teachers recommend an envelope system, breaking up your paycheck into each category of spending that you have allocated at the beginning of the month. Once the envelope is empty, you’re done spending for the month. Some advisors promote the similar concept of money jars for saving. After paying your fixed expenses money is divided among your jars. Each is labeled and designated purpose for discretionary spending. You may have one for entertainment/eating out, another for a new car, one for retirement and one for giving. While I’ve not run across it in the blogosphere or in a magazine, I’ve worked with businessmen that go the effort to post their expenses in a budget like format on posters on a wall in a private area of their company. This is done so that there is visibility (visual control) to the entire organization of the state of their financial direction in terms of sales (income) and expenses. Are you in a position where you are trying to get your significant other and or children on the same page with you regarding finances? Maybe you could use this technique from the world of business. However, most financial management advisors advocate the use of a budget. A budget is a written plan of how you will account for every dollar of income and expense. This is not quite as “visual” in the literal sense. Some find it a little more challenging because it requires you to maintain records of income and expenses. However without one of these or similar tools are you not simply “flying blind” with respect to your money? How can you possible control your spending or prevent overdrafts if you don’t have some mechanism in place? To truly manage your money you must be able to measure in some way; how much you have and where it goes. Envelopes, jars, spreadsheets, computer software or CPA’s; you must find a way to measure or you’ll never be able to manage it. Visual controls can make doing this so much easier. Do you have any unusual visual controls that you use to manage your money or your life? Please share them with a comment on this post!